In addition, there will be a People's Choice nomination to forward to the Space Apps team. People's Choice can be selected in a process determined by the local hosts, such as by popular vote of the local participants at the event or using local judging panels. The local nominations that move forward for global judging will be required to provide a one-minute video within one week of the event to be used in the global judging process. Project pages will remain open the week after the Space Apps event for teams to be able to submit video. The deadline to submit videos for global nominees is Sunday April 19th at midnight (local time). A 6th award will be publicly determined in the People's Choice category. The judges will review the finalists based on a short project description, a one-minute video, and project page links. Any code developed during the event weekend must be open source. To be eligible for global judging your project page must include a link to the code in a public repository. The top 25 People’s Choice candidates will be announced on the Space Apps website. The public can vote for their favorites via social media. 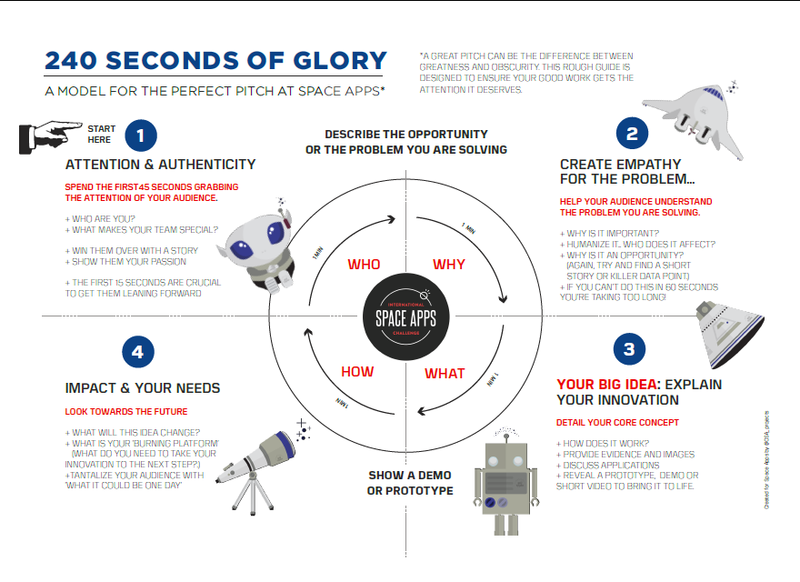 NASA’s Space Apps team will collect social media analytics to determine the winning team. The winning team will be determined based on a formula that will take into account the number of tweets, unique users and timeline deliveries.